Ahead of the Stirling bull sales, Angela Calvert looks at the trends likely to be driving trade. As producers strive to become more efficient and ultimately more profitable in a changing uncertain world, it is clear certain factors are influencing the type of breeding stock they are buying, and when. With more farmers now spring calving, there is a greater demand for bulls at spring sales rather than autumn, which is reflected to a certain extent in prices paid, especially by commercial buyers. Breeders bringing forward animals with good performance figures are being rewarded. It is no longer all about the most impressive animal on the day, although conformation will always count. More buyers are delving into the figures behind the animal and seeking out the traits which will bring about improvement in their own herds. John Roberts, United Auctions’ group sales director, says: “In an ideal world, producers would buy a bull in autumn, giving it time to settle in before being used in spring, but the reality is they do not want to spend money then have the cost of keeping the bull over winter. Neil Shand, chief executive of the Simmental Cattle Society, believes pedigree breeders need to adjust to this trend. He says: “With 80 per cent of commercial herds calving in spring, pedigree breeders need to do the opposite. 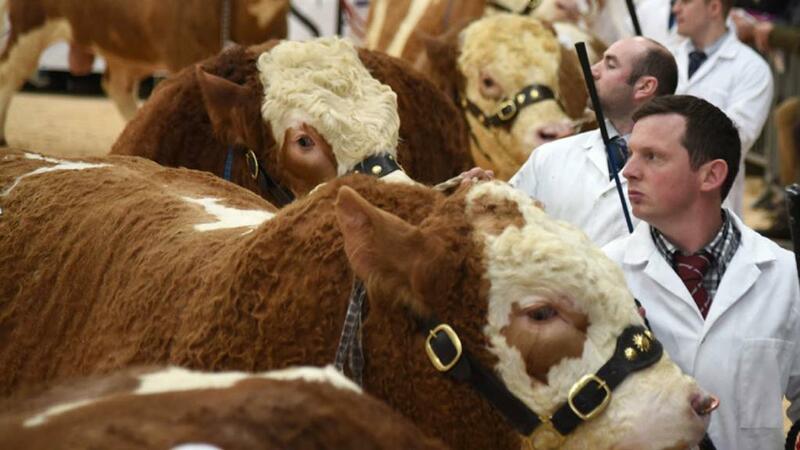 “They need to have bulls 18-20 months old ready to sell between February and May, when commercial producers will happily pay up to 10,000gns for a bull. They will not do this in autumn. “This is something I am trying to encourage our members to do and we are seeing a small shift in pedigree registrations from spring to autumn, but there is still a long way to go. “There is also a clash between the show circuit and pedigree sales. 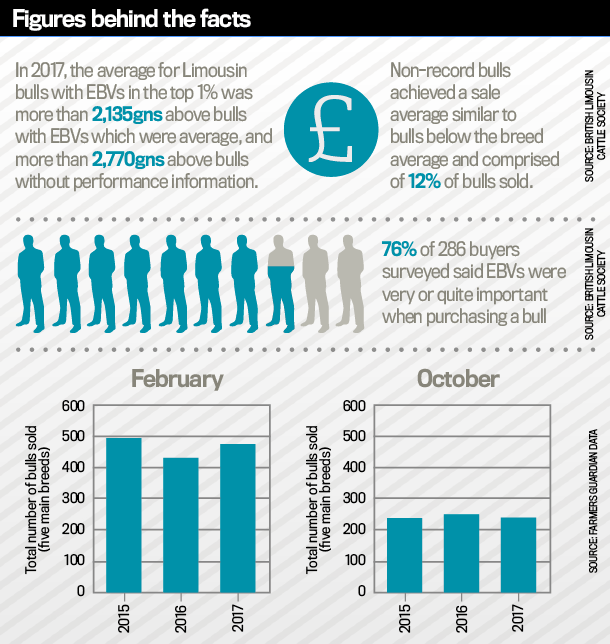 Breeders like to have January or early spring-born bulls to show, but this means they then have to sell them in autumn at a potentially lower price, which presents something of a dilemma for some breeders. “With regards to trade at Stirling in February, I am optimistic. Simmentals have enjoyed a very consistent high clearance rate in recent years for an increasing number of bulls sold, which is good because often if numbers go up, averages go down. “I think this is partly due to the very good demand for maternal traits, but also because, as a society, we have had a big push on high health status, which has helped us gain market share. A sense of optimism is felt by British Charolais Cattle Society chief executive Peter Phythian, with the breed enjoying a resurgence at sales last year after a difficult spell. He says: “Producers were frightened by the drop in weights required by processors, as there were some big Charolais stores in the system at the time, which affected trade for the breed in the short-term. “They have now realised Charolais can be finished quickly at any weight, but this requires changes to management systems. We have also worked hard to improve calving ease within the breed and bulls with good calving ease figures as well as good carcase traits are the most in demand. “Profitability comes down to costs and, while some breeds have premium schemes, cost of production and time to finishing have to be taken into account, which is where the Charolais excels. “With all the uncertainty surrounding Brexit, it is vital to know particularly your fixed costs and what return you are getting. Iain Kerr, chief executive of the British Limousin Cattle Society, believes Brexit is focusing the minds of producers on costs of production. He says: “Producers are realising what they have to do to drive efficiency and are making capital investment in bulls with key economic traits. “There are some very good farmers out there who are doing everything they can in terms of improving feeding and management. “They are looking to genetics to make the extra improvement, so are looking to buy animals with the traits they need at that particular time, especially calving ease, carcase and maternal traits and feed efficiency. “Most pedigree breeders are now performance recording and vendors who are offering bulls of high genetic merit are being rewarded. Of the bulls entered in Limousin sales at Stirling and Carlisle, 83 per cent have a beef value higher than average. “We had a good year for sales last year and I am sure we will build on it. The prime cattle price is solid and I do not see why there should be any deviation from the trend. This year will see a big rise in the number of Salers bulls on offer at Stirling, jumping from 26 last year to 44 this year, a UK record for a society sale. BCMS data shows the breed is enjoying the highest suckler cow sector growth among 10 breeds, 7.1 per cent/pa from 2013-2017 and the second highest in the beef sire sector, 11.6 per cent/pa in the same period. A new breed record for a bull of 12,000gns was set at Stirling last February, only to be equalled at the May sale, then surpassed at 15,000 later in the year at Castle Douglas. Breed society chairman Terence Pye says this increased interest in the breed is driven by the need for farmers to become more efficient by working their cows harder. He says: “The main source of loss to a suckler herd is bad calvings. Not just dead or weak calves and vet’s bills, but barren cows and more replacements, etc. “Salers have an unrivalled reputation for calving ease among the major breeds and calves have high growth rates, and cows are milky, hardy and long-lived. They also cross well with all major terminal sires, especially Charolais. A demand for easily managed cattle, which are economic to keep, is also behind the growing demand for Aberdeen-Angus, according to Alex Sanger, Aberdeen-Angus Cattle Society president. He says: “We are hoping for a good clearance quality cattle at Stirling. The society is constantly attracting new members. “With pressures on agriculture, such as lack of labour and feed prices, people need commercially sound cattle which are efficient, and the Angus fits the brief. The Beef Shorthorn also experienced a very strong trade throughout last year, particularly for females. So much so, breed society president Sally Horrell says many breeders have sold out at home, so do not need to attend the sales. She sees no reason why this demand should not carry on: “Our main sales for bulls are now definitely in spring, with not many bulls forward in autumn.